Game of Thrones is coming to an end and, TBH, we're devastated. The fantasy drama has been a staple on television for the last eight years and our Sunday nights will seriously never be the same without it! In preparation for the final season, it's time to revisit some of the best and most essential episodes of Game of Thrones. The ones with big twists, raging battles, and more than a few dragons. There may not be enough time to binge watch the entire series again, but you can surely pencil in a few of these must-watch episodes before the final season finally arrives! It's hard to pinpoint just 18 essential episodes of Game of Thrones. They're all so good! So, we went with fan faves, eps that push the plot along significantly, or ones that caused an uproar of some type when they aired. All the old standbys are here — The Red Wedding, "Dracarys," and a heavy dose of our old friend, Hodor. This series has been one of the most defining of the '10s and it'll surely be sad to see it go. So, before its swan song arrives, re-watch these essential episodes of Game of Thrones and prepare for the beginning of the end! Obviously the pilot is one of the most essential episodes to re-watch! "Winter is Coming" sets the tone for the entire series. From the first moments, where we get a glimpse of the White Walkers, to Bran Stark (Isaac Hempstead Wright) being shoved out a window it's clear that this show will be anything but boring! It's also the first time we hear the immortal phrase "winter is coming" (spoiler alert: it's now, finally, here!). It's easy to see the hints of things to come — even if things seemed a little bit more hopeful back then! This is the episode where Game of Thrones truly became what it was destined to be. This is the episode where Ned Stark (Sean Bean) is killed, a mere nine episodes into the series. Bean was the big draw for audiences to watch this fantasy series and was presented as playing the lead. To kill your main character in the first nine episodes of a show is crazy. Game of Thrones hasn't played it safe since. The world changed for the Stark kids that day, setting them on dark and complex paths throughout the series. So much of what has happened on Game of Thrones would never have transpired without Ned's death! Ah, Game of Thrones' first season finale. It feels so tame when you think about what was to come! The Starks are dealing with the aftermath of Ned's death, but it's what's happening with Daenerys (Emilia Clarke) in this episode that holds the ultimate significance. She is dealing with the blood magic that stole her beloved and her child from her while trying to retain her husband's followers after his death. The biggest moment of the episode comes when Dany creates a funeral pyre to burn her husband's lifeless body and steps into it herself. She comes out unscathed, holding three hatchling dragons. For the first time in centuries, dragons are alive and the ramifications of that echo throughout the entirety of the series. This is one of the most essential episodes of Game of Thrones mostly because it has its first big battle. The Battle of the Blackwater still remains one of the most epic conflicts of the entire series. We see, finally, how powerful wildfire really is. Plus, who can deny how striking the green fire looks during the dark-of-night battle?! It's as gorgeous as it is brutal. "Blackwater" is also the first glimpse we get of what Tyrion (Peter Dinklage) is capable of. His wartime acumen saves the day and sets the precedent for his intelligence coming in clutch more times than we can count. This is one of those episodes that is so completely vital for keeping the plot going. Dany finally commands an army of 8,000 unsullied and orders them to kill the slavers of Astapor. In one fell swoop, she ends the slaving culture of the island, frees the slaves that are still encaptured, and adds thousands of fighting men to her ranks of their own free will. 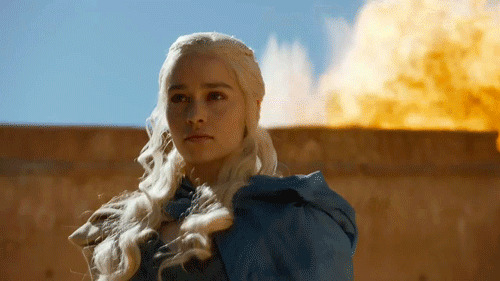 It's a huge turning point for the would-be Queen, showing exactly what she and her dragons are capable of. Elsewhere, chaos breaks out beyond the wall at Craster's Keep, leading to a change in command for the Night's Watch. For a mid-season episode, this one packs a huge punch! Essential episodes of Game of Thrones aren't just about battles and dramatic moments. Sometimes, it's the episodes with the small character moments that are most important. This episode explores the many layers of Jaime Lannister (Nikolaj Coster-Waldau) as he bonds with Brienne of Tarth (Gwendoline Christie). We finally learn the full story behind Jaime being dubbed "The King Slayer" and why he turned on the Mad King. It's also the episode where Jon Snow (Kit Harrington) and Ygritte (Rose Leslie) get it on in a cave. Jon Snow may know nothing, but we know we love this rare romantic scene! You may know this one by another name: The Red Wedding. Yep, this is the batsh*t crazy episode that really showed fans that Game of Thrones was not messing around! Robb Stark (Richard Madden) is beginning to look like a true King of the North, and a frontrunner in this silly game of thrones. But he, his wife, and his mother are all slaughtered in the most brutal fashion imaginable. It's gut-wrenching to watch and even harder to comprehend. The consequences of the Stark murders reverberate throughout Westeros from that day forward and we still can't here a cello without having PTSD flashbacks! DING DONG THE KING IS DEAD. Finally! This is an essential episode for any Game of Thrones re-watch because it shows the oh-so-satisfying death of King Joffrey (Jack Gleeson). The ruthless, pint-sized King is finally killed — and at his own wedding, to boot! After The Red Wedding, any Game of Thrones fan knows to tread lightly with marriage ceremonies. But, in this instance, the death of Joffrey is more than welcome! This is also the episode where we see Bran's journey towards becoming the Three-Eyed Raven truly begin. We didn't know it then, but that transformation has become invaluable! This is not only one of the most essential episodes of Game of Thrones, but also one of the most shocking of all time. After Tyrion is accused of murdering Joffrey, he demands a trial by combat. He chooses the noble and nimble Oberyn Martell (Pedro Pascal) to fight on his behalf. His challenger is Gregor "The Mountain" Clegane (Hafþór Júlíus Björnsson) who is a formidable opponent and the man who killed Oberyn's sister. The emotional fight seems to be going in Oberyn's favor until a silly mistake ends in his eyes being crushed beneath The Moutain's giant hands. It's one of the most gruesome scenes in the series and one that will be seared into your mind forevermore. Family can be the worst, am I right? The Lannister clan knows this all too well. After losing his trial by combat, Tyrion knows he is destined to be put to death for a crime he didn't commit. So, what does he do? Shoot his father with a crossbow while he's on the toilet and GTFO of King's Landing! The significant event is what comes after. Tyrion boards a boat to Essos set firmly on a collision course with Dany. The episode also features Brienne and The Hound (Rory McCann) engaging in one of the most masterful fights of the series. This is the true turning point on the series where it goes from people fighting over a throne to people fighting for their lives. The White Walkers are teased in the very first episode, but we don't see enough of them to gauge their power in the first few seasons. "Hardhome" rectifies that, providing one of the most intense battles of the series in the process. When Jon is trying to recruit a Wildling camp to help fight the White Walkers they suddenly invade, hundreds of them at once. They're severely outnumbered and, until this battle, don't know all the ways to kill them. The most unforgettable part of the episode is the survivors leaving the scene on a boat only to watch in horror as the dead are raised as White Walkers before their eyes. That scene alone makes this one of the essential episodes of Game of Thrones! This episode features one of three "holy sh*t" moments that Game of Thrones writer George R.R. Martin revealed to the showrunners. The moment is, coincidentally, one of the most difficult of the series to watch. Stannis (Stephen Dillane), one of the many candidates for the throne, allows the Red Witch Melisandre (Carice van Houten) to burn his daughter to death in order to please their God. It shows the lengths the clamorers for the throne will go to to try and capture what they think is rightfully theirs. On the brighter side of things, the episode also shows Dany riding her dragons for the very first time. It's a triumphant moment to even out the depressing tone of Stannis's sacrifice. (A.K.A. the episode where Jon Snow comes back to life!) After being murdered by his peers in the Night's Watch for conspiring with the Wildlings, it seems that Jon Snow may actually be gone. All seems lost until Davos Seaworth (Liam Cunningham) convinces Melisadre to try and use her powers to revive Jon. At first, it seems that it didn't work and that Jon Snow is really dead. But the end of the episode reveals Jon's eyes opening and life returning to his body. It's the first of many divergences from the books (since the books haven't gotten past his death, yet!) and one of our favorites! This may be the most heart-wrenching episode of Game of Thrones of all time. This is the episode where we learn why lovable, yet stunted, Hodor (Kristian Nairn) is the way he is. Bran realizes his time-traveling abilities via the Three-Eyed Raven and he explores the past. In the process, he meddles too mcuh and reveals that his future foray into the past actually destroyed Hodor's mind and left him permanently stuck "holding the door." After we learn all this, loyal and loving Hodor meets his end (another "holy sh*t" moment from the showrunners). It's almost too painful to watch but it's definitely a necessary episode for any Game of Thrones re-watch! Six seasons in and Game of Thrones was still crafting new and innovative battles. The Battle of the Bastards, between Jon Snow and Ramsay Bolton (Iwan Rheon), seems hopeless for our heroes from the jump. Bolton has the numbers, a Stark boy held hostage, and a sociopathic need for chaos. One of the most riveting shots of the series is when Jon is standing, seemingly alone, holding his sword as Ramsay's men charge at him. Then, suddenly, Sansa (Sophie Turner), the armies of the North, and hordes of Wildlings are there backing Jon up and bringing home a victory. The perfect ending is when Sansa, who was raped and beaten by Ramsay repeatedly, brings about her abuser's death and finally gets vengeance. Y'all think Cersei (Lena Heady) was going to sit by and let King's Landing fall out of her reach? Of course not. So in one swift and ruthless move, she decimates the Great Sept of Baelor with wildfire, killing everyone inside. This led, directly and indirectly, to the death of over 10 regular characters on the show. From there forward, she was officially the Queen, a title she had been admiring since the pilot. Aside from Cersei's vengeance, we see Jon Snow finally being crowned King of the North just as Bran (and the viewers!) learn of his true parentage. The lore implications alone make this one of the essential episodes of Game of Thrones. R+L=J, confirmed! Sometimes the most essential episodes of Game of Thrones are the most satisfying ones. This episode provides so many things that fans had been clamoring for! The Loot Train Battle at the end of this episode is the first time we see Dany truly flex her biggest wartime advantage: her dragons. She leads a Dothraki army as she flies in on Drogon to destroy a Lannister Caravan heading back towards King's Landing. For all of them, it's the first time they've seen a dragon — and the last, since so many are burned to a crisp! Dany finally shows what she's capable when able to be fully uninhibited in battle. Elsewhere, Arya (Maisie Williams) and Sansa are reunited at last after being apart since prior to Ned's death on the show's first season! It's not an easy homecoming, but it's a necessary one for so much of what's to come. After the intense events beyond the wall, Jon and Dany know they need help if they're going to stop the White Walkers and the Night King. So, they go to King's Landing to plead their case to Cersei. It goes about as well as you'd think. But, there are major wins in this episode. Arya and Sansa finally exact revenge on Littlefinger (Aidan Gillen) for all the BS he's put them through since their father's death. Jon and Dany get it on (despite the, ahem, familial ties). Oh, and the Night King gets a goddamn White Walker dragon and decimates the wall. That one's more of a win for the enemy than our heroes. The Wall falling sets the stage for this show to become so much more than a "game of thrones" in the final season. Winter is here! Next Story → The Stranger Things 3 Trailer Drops & Who The Heck Is Kissing At 2:18?